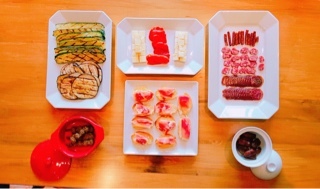 The culture of sharing little bites is everywhere in the world: the French pass around hors d’oeuvres, Italians have antipasto, and Chinese families love dim sum. In Spain, they’re known as tapas, a selection of cold or hot dishes often eaten as a snack but could be combined into a meal. While travelling in Barcelona, they were a wonderful pick-me-up after hours of sightseeing to refill on nutrients and cool down with beer or sangria. Sometimes tapas are purchased, but the simpler versions are offered on a complimentary basis with drinks. In fact, the practice began when bread or meat slices were given out to patrons at taverns to cover their glasses and keep out the blowing sand from dirt roads. 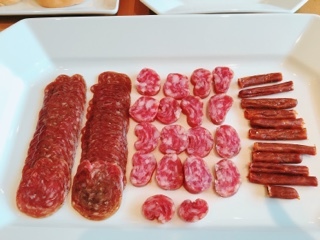 The meats also tend to be saltier to encourage drinking and higher alcohol sales. 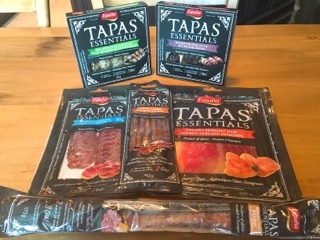 This year, Espuña Tapas Essentials is crossing the ocean and entering the Canadian market. Currently found in Longo’s Market stores, they offer a variety of 18 sliced meats and heat-and-serve products. As an introduction I received a selection of products to try and invited friends over to sample them over wine – luckily my home wasn’t overly dusty as there’s no way these meats would cover the large wine glasses we use nowadays. Directly translated as “mountain” ham, the Serrano ham used to be cured in sheds in high altitudes. Delicious on its own, I also enjoyed the ham on toasted bread brushed with olive oil with lightly aged white cheddar. 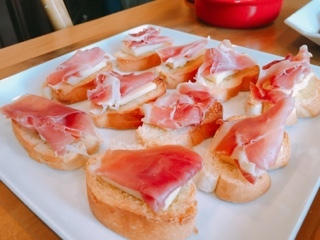 The heat of the bread starts to warm through the cheese and softens the thin layers of fat on the Serrano ham to give the tapa a creamy feel. If you like your charcuterie fattier (especially when pairing with beer), Espuña has a whole line of salamis. The Barcelona style (on the left in the picture below) is less blubbery and seasoned longer to really allow the salt and pepper to permeate the meat. The longer curing period also makes the pork dryer and a tad gamier than your typical salami. Meanwhile, the original Olat salami (in the middle in the picture above) originates from the founder’s region, in the North Eastern part of Spain. Larger chunks of fatty pork is stuffed into a thin casing and seasoned again. A little greasy for my tastes, but was the salami my husband happily inhaled. If you’re in the mood for a real salty snack, the chorizo cañitas takes pepperettes to the next level. Like its name, the cañita is thin and long like a “drinking straw”; Espuña even suggests you serve them standing up in a glass with breadsticks. 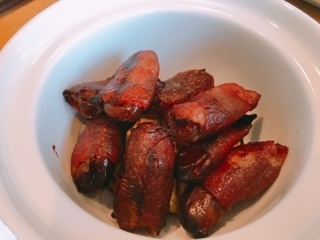 For me, since the soft pork was so well-seasoned with salt and paprika, I found the cañitas were best consumed in small pieces tucked into a soft piece of bread. Use them for a quick omelette: dice one cañita into small pieces, mix into two beaten eggs, and cook! You don’t even need to add any salt and pepper, making it one of the quickest breakfasts I’ve ever made. The heat and serve line is ingenious for making tapas that could transform into a hearty meal. 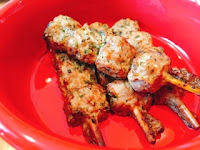 After removing from the packaging and a quick minute in the microwave, I was presented with juicy aromatic meat skewers with chopped fine herbs and a sweet and salty bacon wrapped dates. These are great for dinner parties, especially since they can be prepared in small batches to provide guests with a hot treat. When Esteve Espuña first started making sausages in a farmhouse near Olot, little did he know that his creations would eventually be eaten worldwide. Thanks to his family member’s working to expand the brand, I’ve received a taste of Spain in Canada. Mix with fresh bread, a selection of cheeses and grilled vegetables, their creations really allowed for a satisfying spread with friends.